Exit at Junction 7 of the M56 and follow the signs to Altrincham on the A56. After one mile, at the first set of traffic lights, turn right into Park Road. This leads into Langham Road. Continue for one and a half miles to the traffic lights at crossroads where Stamford Road, Ashley Road, Marlborough Road and Langham Road all meet. Turn right into Ashley Road. Continue along Ashley Road for about half a mile; over the level crossing, past shops and through Hale village. Hale URC is on the right of Ashley Road on the corner of Cecil Road. Turn right into Cecil Road and the car park is on the right. Car parking is also available on most Sundays, immediately across Cecil Road, in St Peter's Assembly Rooms' car park. Exit at Junction 6 of the M56 and follow signs to Hale and Altrincham along the A538 which is called Hale Road. Continue along Hale Road for two miles to crossroads with traffic lights. Turn left into Park Road. Turn first right in 50 yards into Planetree Road. Continue down Planetree Road which leads into Harrop Road for half a mile until a T junction. 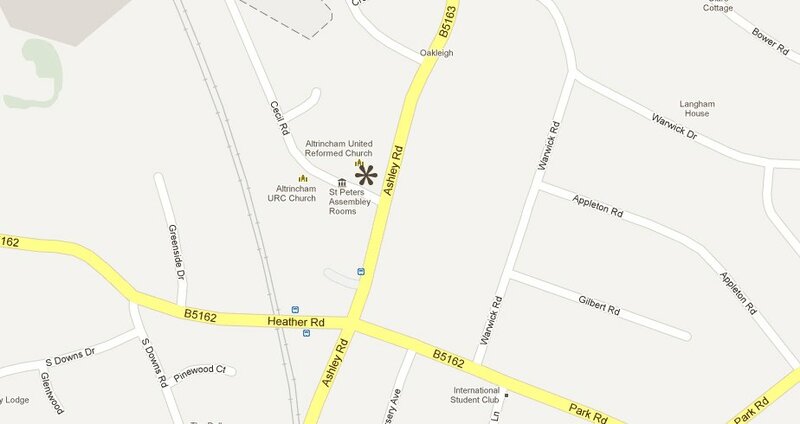 Turn left into Ashley Road and Hale URC is about 100 yards on the right on the corner of Cecil Road. Turn right into Cecil Road and the car park is on the right. Take a bus or a Metro to Altrincham Station. From there the walk is just over a mile. Turn left as you come out of the station along Stamford New Road. Continue along this for about half a mile past crossroads with traffic lights, shops and a set of pedestrian lights. It becomes Ashley Road and you pass another set of pedestrian lights and a mini roundabout. At the crossroads where Stamford Road, Ashley Road, Marlborough Road and Langham Road all meet, turn left into Ashley Road. Continue along Ashley Road for about half a mile; over the level crossing, past shops and through Hale village. Hale URC is on the right of Ashley Road on the corner of Cecil Road.